Carters Estate Agents are delighted to offer for sale this four bedroom detached family home with situated in the sought after location of Giffard Park. This property sits on a large plot and offers extensive parking, which would be ideal for a small boat or caravan. The accommodation in full comprises, entrance hall, shower room, lounge, dining room and re-fitted kitchen to the ground floor. The first floor benefits from four bedrooms and a re-fitted bathroom. To the exterior there is a garage and driveway, plus extension parking to the opposite side of the property. The large rear garden completes this ideal family home. Ground Floor - Enter via a part glazed door with glazed side window into the entrance hall. Stairs rising to the first floor landing. Understairs storage cupboard. Doors to all rooms. The shower room is located to the front of the property and comprises a low level w.c., wash hand basin and a corner shower cubicle. Obscure double glazed window to front aspect. The lounge is a dual aspect room with double glazed French doors opening onto the rear garden and a double glazed box bay window to the front aspect. The main focal point of this room is the stone built fireplace with an open fire. The dining room is located to the rear of the property with a double glazed window overlooking the garden. The kitchen is re-fitted in a range of units to wall and base levels with worksurfaces over and an inset sink/drainer. Gas and electric cooker points with extractor hood over. Integrated dishwasher. Space for fridge/freezer. Plumbing for washing machine. Underfloor heating. Window to rear aspect. Part obscure glazed door to the driveway. First Floor Landing - Access to loft. Airing cupboard housing hot water tank. Doors to all rooms. Bedrooms one and two are double size and located to the rear of the property with windows overlooking the garden. Bedroom three is also located to the rear with a window overlooking the garden and bedroom four is located to the front of the property with a window to the front aspect. The bathroom has obscure double glazed windows to front and side aspects and has been re-fitted with a suite comprising low level w.c., wash hand basin set into a vanity cupboard and a panel bath with shower over. Tiled flooring. Complimentary tiling to walls. Exterior - The driveway is located to the lefthand side of the property with parking for one vehicle leading to a detached single garage with up and over door, power and light connected. Courtesy door to rear garden. There is an additional gravel driveway offering substantial off-road parking to the righthand side of the property. The large rear garden is mainly laid to lawn and part enclosed by mature shrubs and trees. There is a patio and a further gravel seating area to the side of the garage. Timber shed to remain. Gated side access leading to the front of the property. Disclaimer - Property reference 28636990. The information displayed about this property comprises a property advertisement. Rightmove.co.uk makes no warranty as to the accuracy or completeness of the advertisement or any linked or associated information, and Rightmove has no control over the content. This property advertisement does not constitute property particulars. 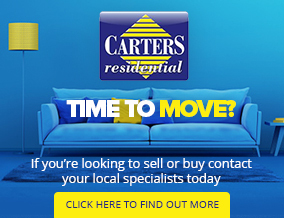 The information is provided and maintained by Carters Estate Agents, Stony Stratford & Milton Keynes . Please contact the selling agent or developer directly to obtain any information which may be available under the terms of The Energy Performance of Buildings (Certificates and Inspections) (England and Wales) Regulations 2007 or the Home Report if in relation to a residential property in Scotland.